While Ava took her afternoon nap today I decided to be productive and finish one of the 900 projects I've started. (ok, maybe there aren't 900- but there are at least 9!) The project I chose to tackle today was a stuffed owl I wanted to make for Ava. I had made one for my niece for her 2nd Birthday back in September and started Ava's at the same time. It was a twin owl, cousin, i love you thing. 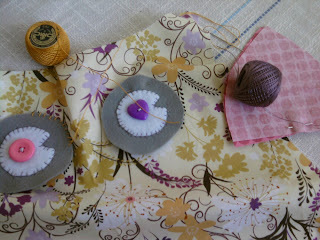 There is a lot of hand stitching involved in this project. Lots of layers and I use a super thick thread, made for hand stitching. I did the small hand stitching parts first to get them out of the way. When I had finished with that and moved on to the more intensive hand stitching parts I needed a lot more thread. As I began to sew I was getting into a rhythm and then the thread stop short. I turned the owl over and saw a huge knot. I didn't understand how it could knot, but it did. I got it out and continued on, only to get another knot after a few more stitches. This continued to happen every 4-5 stitches. I was getting a little bit irritated. Then I felt like God said" You're getting caught up in your own thread". I sat there for a minute just staring at the needle and thread, slightly shocked that God used sewing as an example and also trying to figure out what that meant. Here's what I arrived upon. Our lives are a long thread. We sew and get into a rhythm of things, and then we let ourselves get upset about something we don't have control over, or we are envious of something we don't have, or wish we were somewhere else. Every time we focus on one of those tings we get a knot in our thread. Causing us to stop and untangle ourselves, hopefully learning the lesson we needed to. But all to often after getting back into our rhythm we are in a knot over the same thing again. I need to focus on the important things and find a good rhythm. Trying every day not to get caught up in another knot. I hope you can find your rhythm.